It’s incredible to think that we’re on week 44 of the year already! I’m also really pleased with myself for having done a blog each week of the year for my hobby progress, so let’s dive into what I’ve been up to this week! First of all, the next Alpha Legion project that I mentioned last weekend has gotten off to a fine start! Not only have I done the armour on the ten tactical marines, but I’ve also built and painted the armour on the rhino! It’s the same technique that I’ve been using since May-time, which I wasn’t sure would translate well to the rhino and, while in all honesty it could look a lot nicer, I’m still happy with how it’s turned out. The Sotek Green base needed, I think, 5 coats to go on smoothly, and I’ve ruined the large base brush I’ve been using for these things, but overall it went on smoothly. The Drakenhof Nightshade shade didn’t work quite as well, it looks a bit streaky unfortunately, and the Teclis Blue drybrush hasn’t been as good as I’d hoped to clear that up. But I think it’ll look better when it’s finished, with the tracks and the silver bits, etc. I’m also plotting to do some weathering on this thing, partially because I want to draw it in with the rest of the army and have red mud in the tracks, but also I think it’ll help to make the large panels look more interesting. We’ll see how that all goes, anyway! I’ve not had much time to do anything else last week, because of both work commitments and working on an essay for my degree. I have managed to build up five more Deathwatch marines, built as Kill Team Excis as an expansion to the Overkill box (the rules for these marines were featured in the first issue of the new White Dwarf back in September). I’ve now gone over all of the Deathwatch marines that I’ve got on the table, and painted them with Abaddon Black. I was clearly in that kind of mood, I suppose!! At least they’re one step closer now, anyway. We’ve had some half-decent weather this weekend actually, so I managed to prime up a bunch of models for the Genestealer Cults, as well as the other guys from my Militarum Tempestus command squad, so that’s been really useful as I’m now set with a lot of primed models for the rest of the winter. Last year I started to paint a Deathwing army, which is still currently in need of a few touch ups here and there, but consisted of ten Terminators and a Venerable Dreadnought. 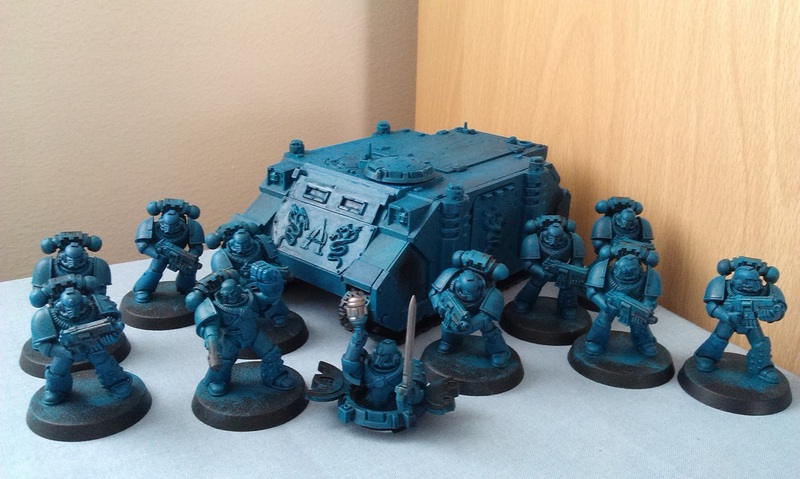 Despite having since built up five Deathwing Knights and Belial, and bought a Land Raider Crusader and a Drop Pod for them all (Knights and Belial in the Drop Pod, Terminators in the Land Raider), I’ve felt like my whole impetus to get these guys painted has just stalled. I tried building up some more Terminators to revive my interest, but it didn’t really work. So, this afternoon I’ve treated myself to something that I’ve had my eye on for quite a while now, in the hope that it will spur me on! I am feeling a bit adrift right now, so I’m not quite sure where to go next. I suppose we’ll just have to wait and see! Are you priming your miniatures? 5 coats of Sotek Green seems like a load (unless you have made them very thin). Oh, yes! It was really thin – probably too much so, really. This is the first vehicle I’ve painted in a long time, and all the flat areas kinda intimidated me, as I thought it might be a problem, seeing brush strokes etc, so wanted to build up the colour gradually. It looked fantastic, until I then shaded it with Drakenhof Nightshade and ended up with a bunch of streaks.. Pants. Try thinning the wash with Lahmium medium next time too? You know, I never use that stuff – should try it next time, thanks for the tip!